Biometric studies of the genetics of personality and intelligence have used several methods including studies comparing identical and fraternal twins, adoption studies comparing children with biological and adoptive parents and siblings, and family studies of first degree relatives from intact families. The methodology for these studies is aptly described in the most recent edition of "Behavioral Genetics" (Plomin, DeFries, McClearn, & Rutter, 1997). The first genetic study of sensation seeking analyzed the genetic and environmental contributions to the trait in a large sample of English twins (Fulker, Eysenck, & Zuckerman, 1980). The correlations for identical (MZ) and fraternal (DZ) are shown in Table 1. Heritabilities calculated for these data showed that 58% of the variation in the trait, as measured by the Total score on the SSS V, could be accounted for by genetic factors. The heritability would be 69% if corrected for the unreliability of the SSS measure. This is a high heritability for personality traits which usually average at about 40% for the uncorrected heritability (Bouchard, 1994; Loehlin, 1992). The remaining variance was due to the specific or nonshared environment and error of trait measurement. There was no detectable effect for shared environment, or that part of the environment shared by virtue of having the same parents and growing up in the same general social environment. share only half of their genes their correlation must be doubled and thus yields a heritability of 64%. If we average these two estimates we get 59%, almost exactly the same 58% heritability found in the Fulker et al. study of twins raised together. This would indicate that the shared or family environment of twins does not account for the variance in the trait. The heritability data for the subscales in the Fulker et al study were analyzed by Eysenck (1983). A replication study in a Dutch population (Koopmans et al., 1995), and the separated twin study (Hur & Bouchard, 1997) also analyzed the data by the SSS subscales. The results from these studies are shown in Table 2. The heritabilities for the three subscales Dis, TAS, and ES were fairly similar across the five groups in the three studies, averaging .50 to .57. That for BS was lower, probably because of the lower reliability of this subscale. None of the studies showed effects of shared environment and the remaining variance was due to the non-shared environment and error. Eysenck found specific genetic factors accounted for the predominance of the genetic variance for the subscales, except for ES which was almost entirely accounted for by the general genetic factor found in all of the scales. Koopmans et al. could not find one genetic factor underlying all 4 subscales, but did find genetic coveriance between Dis and BS, and another genetic factor underlying TAS and ES. Dis and BS are the most elevated scales of sensation seeking found in antisocial personalities of the primary type (Emmons & Webb, 1974). The Hur and Bouchard study also included the Control scale (an inverse measure of impulsivity) of the Multiple Personality Questionnaire to their separated twins. The Control scale correlated negatively with all of the SSS subscales, and for all but the TAS scale the major part of the covariance was due to shared genetic variance by Control and SSS. This genetic relationship between impulsivity and sensation seeking is supportive of the new scale combining the two (ImpSS). * From D. I. Boomsa, et al. (1999) Twin Research, V2, 115-125. Copyright Stockton Press 1999. Reprinted with permission. Koopmans, 1999). The overall heritability for the Dis scale was high (.60-.62). Boomsa et al. divided the sample of twins into those with a religious upbringing and those with no religious upbringing. Most of the twins continued to practice or not practice their religion as a function of their upbringing. Both upbringing and current religion showed high concordance in twins regardless of zygosity indicating that only shared environment influenced past or current religion. As expected, those with a religious upbringing had lower scores on Dis than those with no religious upbringing. Table 3 shows the twin correlations on Dis for twins with and without a religious upbringing. For males with a non-religious upbringing the analysis showed a moderate effect of an additive genetic factor (49%), a small effect of shared environment (11%), and a moderate effect of non-shared environment (40%) on Dis. But for males raised in a religious environment the correlations for identical and fraternal twins were the same and both were high. Genetic factors accounted for none of the variance and all of the variance on Dis was due to shared (62%) and non-shared environments (38%). Females with a non-religious upbringing showed a strong genetic effect and no effect of shared environment, whereas those with a religious background showed a lower effect for genetic factors and a significant influence of shared environment as well as non-shared environment. In sum, a religious upbringing attenuates the genetic influence and increases the shared environmental influence as well as lowering the overall scores on Dis. In the absence of a religious upbringing the genetic factor becomes paramount. The overall result for the total population conceals what appears to be a real genotype X environment interaction. 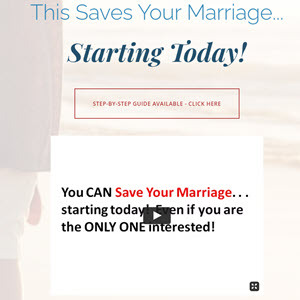 Do you need to save your troubled marriage? Save Your Marriage and Develop a Lifelong Love. If you are having trouble in your marriage, you are not alone.